Enjoying life to the fullest means being in contact with your surroundings — and that requires constantly changing visual focus to accommodate our everyday activities — at far distances, at arms length and up close. Until recently, life without reading glasses or bifocals was not an option for most cataract patients. YOU now have an option. The Multifocal Premium Lens Implant is a unique technological innovation that can provide you with quality vision throughout the entire visual spectrum – near through distance – with increased independence from reading glasses or bifocals! Presbyopia is a natural aging process that occurs when the lens inside the eye becomes harder and less elastic. This loss of flexibility reduces the eye's ability to switch focus from seeing objects at a distance to seeing objects that are close up. 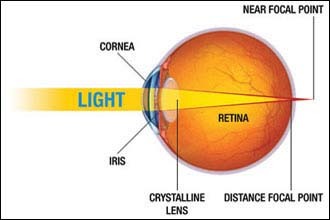 Because of this the near focal point falls behind the retina (see image below). Presbyopia may seem to occur suddenly, but the actual loss of flexibility takes place over a number of years. Presbyopia usually becomes noticeable in the early to mid-40s. 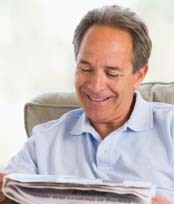 Presbyopia is a normal part of the aging process of the eye. It is not a disease, and it cannot be prevented. Some signs of presbyopia include the tendency to hold reading materials at arm's length, blurred vision at normal reading distance, and eye fatigue along with possible headaches when doing close work. A comprehensive optometric examination will include testing for presbyopia. Multifocal Premium Lens Implants are the most striking advance in cataract and presbyopia corrective surgery in 25 years. Traditionally, artificial intraocular lens implants were monovision, meaning that they could only focus distance, near or intermediate between the two. In most cases, reading glasses or bifocals were still needed for fine visual tasks such as reading small prints. With modern technological advances, Multifocal Premium Lens Implant are now available that can provide good distance, intermediate and near vision without the need for glasses. Although these new implants do not completely eliminate the need for reading glasses they greatly reduce one dependency on reading glasses. The Multifocal Premium Lens Implant can help you regain natural youthful vision, allowing you to drive, read, enjoy sports, and work on the computer with little or no need for glasses. Monofocal Lens Implant - simulated view. Distance vision is clear, while near vision is out of focus. Multifocal Lens Implant - simulated view. 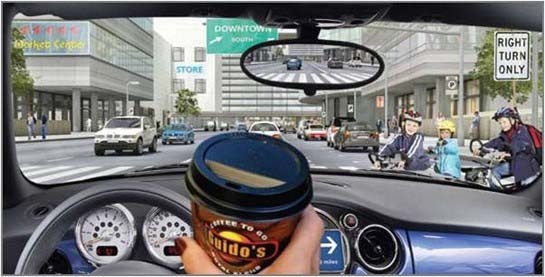 Vision is clear at all distances: near, intermediate and distance. For further information, please call our office at 01292 282100 with any questions or to arrange an valuation for treatment.